Advanced Micro Devices (AMD) trotted out several new processors at CES 2013, including both high performance desktop and notebook GPUs and new accelerated processing units for tablets and notebooks. The APUs, codenamed "Temash" and "Kabini," will be the first quad-core system-on-a-chip processors based on x86 architecture rather than the more common ARM-based mobile chips. Temash is designed for Windows 8 tablets and convertible tablet/notebook hybrids, promising a 100 percent graphics processing performance compared to AMD's previous Hondo chips. Kabini will come in both dual-core and quad-core varieties to be used in ultrathin notebooks, which AMD boasts will offer improved battery life and a 50 percent performance improvement over the company's last Brazos 2.0 processors. AMD announced it is also now shipping a new "Richland" APU to manufacturers that can offer performance increases between 20 and 40 percent. A follow-up to Richland, codenamed "Kaveri," is planned for the second half of 2013 based on AMD's 28nm manufacturing process. 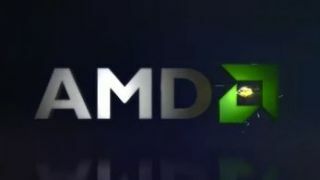 AMD has not forgotten about larger computers though, and also announced at CES 2013 its new line of Radeon HD 8000 GPUs. The Radeon HD 8000 will utilize AMD's Graphics Core Next architecture with support for Direct X 11.1 and PCI Express 3.0. It will also be available in a mobile version, the Radeon HD 8000M, which uses what AMD calls "Enduro Technology" to dynamically scale GPU usage to conserve battery power. You won't find Radeon HD 8000 series chips on store shelves though, as AMD says it is only shipping the GPUs directly to manufacturers. ASUS and Samsung will be the first to make use of them, with Lenovo, Dell, and other unnamed firms on board to ship later in the year.